This year I am attending the European Geisciences Union General Assembly or for short the EGU2014 meeting in Vienna, Austria, 27 April – 2 May. 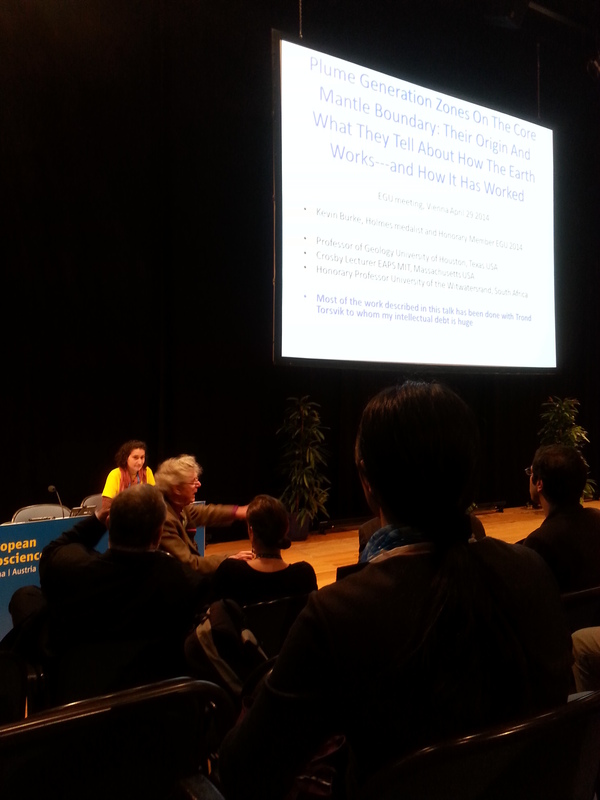 The EGU meetings are BIG! Geoscientists everywhere! More than 600 sessions, workshops and short courses. A multitude of geotopics with something for everyone. I arrived yesterday, so I have only attended half a session so far, but I have seen plenty of posters and met many colleagues. Today I am especially looking forward to the Arthur Holems Medal lecture by Kevin C.A. Burke on “Plume Generation Zones on the core mantle boundary: their origin and what they tell us about how the Earth works – and how it has worked”. And also to spend the afternoon at session SSP2.3: “Late Palaeozoic and Mesozoic stratigraphy, paleoceanography and paleoclimate” (sponsored by the IAS). I am also co-author on a poster in the session “Rifts and rifted margins: The sedimentary, volcanic and crustal architecture”, so I have to check out that. The poster is entitled “Pre-breakup age of East Greenland Ridge strata” by Tove Nielsen, Morten Bjerager, Sofie Lindström, Henrik Nøhr-Hansen, Tine L. Rasmussen (Abstract).